Informational text that exposes its “structural information, such as hierarchical relations” gets high reading comprehension scores, whether readers have prior subject knowledge or not. This is the result of a study reported in Learning Solutions Magazine by Chris Atherton. And it’s good news for technical communication because it means structured writing and topic-based authoring done well benefit novice and expert users alike. Novices understood the hierarchical format best, closely followed by the mixed format, with the linear format a distant third. Experts understood the linear format best, closely followed by the hierarchical format, with the mixed format a distant third. So exposing the hierarchy and structure of the text benefits novices and experts alike. If you’re writing for experts only, presenting linear text gives them a slight advantage, but “shuts out” novices. Structure authoring helps your users understand and remember. Novice and expert users alike can make sense of the information not only from the individual bits and pieces, but also from the structure how everything hangs together. For example, consider relating concepts and sub-concepts to on another. Or when instructing users to do tasks, consider giving an overview of the big picture process first. Then break down the process clearly into distinct procedures and further into individual steps. For many readers, easy access to structure also helps them to retain information better, regardless how they manage to memorize it. Structured authoring helps you to create complete documentation efficiently. You can organize and maintain your information more efficiently with structure and hierarchy. Structure makes it easier to ensure that each piece of information has a distinct place, so you can avoid redundancies. Hierarchies make it clear where your concepts and procedures are complete and where you still have gaps. It’s easier to note a missing topic or sub-chapter than a missing paragraph somewhere in linear text. For novices, linear text is a distant third, so relying on “linear” requires that you have a homogenously expert audience. For you as a writer, linear text possibly takes more time or effort to maintain, depending on how much text you maintain and how often you update. For other writers who need to edit or update your documentation, linear text is probably harder than topics that expose the internal structure of the subject matter. Explanations are hard and try as you might, they can still fail – as anyone knows who has given driving directions to a stranger and then seen them make the wrong turn. The key to good explanations is empathy with the “explainee”, so you can explain something in their terms. What gets in the way is the “curse of knowledge” which means we cannot remember what it was like not to know how get to the specialty store or how a cloud service like twitter or dropbox works. To show how explanations increase understanding, Lee used an explanation scale. First you have little understanding, and you care about the big idea, the “why?” Why should you care about a cloud service, why is this important to you? Once you have the “why?” down, you’re ready for basic understanding of the essentials, the “how”? How does a tool work, how can I use it to my benefit? To get expert understanding, you assemble more and more details for different scenarios – and before long, you have all the knowledge to explain this thing yourself! Context anchors an explanation in shared experience and creates agreement. We all know what it feels like to have misplaced your keys, and we can agree that it’s very annoying. Context is important to show why something is relevant to you. Story ties together a problem and its solution in a narrative arc. That can be as simple as: “Bob has a problem. Bob finds a solution. Bob is happy!” Story invites our empathy because we can identify with Bob and root for him. It illustrates facts, such as cause and effect, in real life. Connections can provide a shortcut to other stories we already know. When the producers of the 1979 science fiction movie “Alien” sought funding, they connected their project to a recent successful movie in three simple words: “Jaws in Space”. Analogies can emphasize “what’s really going on”. Consider an encounter with a bear and how it sets off your “fight-or-flight” impulse with stress hormones. Now transfer that experience: “Imagine the bear comes home from the bar every night.” This analogy gives you a good impression what it feels like to be the child or partner of an abusive alcoholic. Lee closed by sharing several examples, both from his CommonCraft videos and elsewhere. My presentation will explore how “meaning” works in technical communications, why it fails and how you can create meaningful documentation. I will draw on the cognitive psychology of mental models and advances in user experience design to show why minimalism works, but FAQ’s don’t, and how to write for users without irritating them. 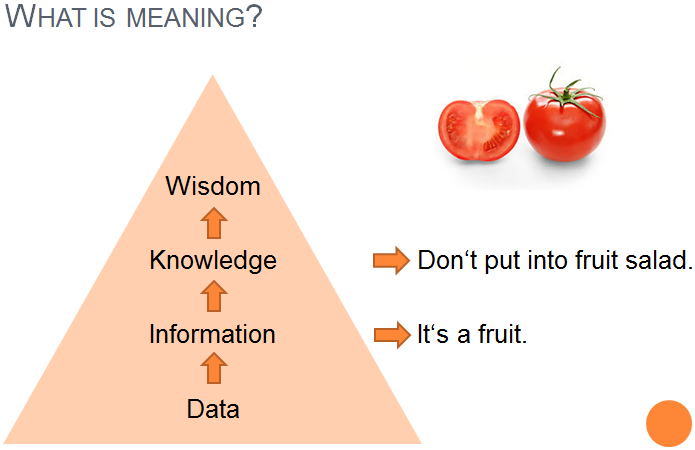 Being meaningful in technical communications is harder to measure than being correct, concise or consistent. However, it is just as essential: Understanding how and why communication is meaningful to users helps to create more effective documentation. Participants will get a deeper understanding and a fresh perspective on what makes communications meaningful. It’s a G-rated session, so you don’t need any previous experience or knowledge of psychology – just a curiosity what makes us tick when we read and write documentation. So treat yourself to a fun romp of aha moments in the last session slot of the day – hope to see you in Atlanta! Join me for my presentation “Addicted to Meaning: How Good Technical Communication is Like Bad Magic Tricks” at tekom/tcworld in Wiesbaden on Tue 23 Oct at 1:45 pm. In the session, I will explore how “meaning” works in technical communication, why it sometimes fails and how you can improve its chance for success. Being meaningful in your work is harder to measure than being correct, concise or consistent. However, it is just as essential: Understanding how and why communication is meaningful to your readers can help you to make your documentation more effective and to distinguish good from bad. I will put our familiar tech comm tool box into a new context, so you can get a deeper understanding and a fresh perspective on tech comm and how it fits into the bigger picture of meaningful communication. But do we create documentation with meaning?